At 18 minutes after noon on February 26, 1993, a huge bomb went off beneath the two towers of the World Trade Center. This was not a suicide attack. 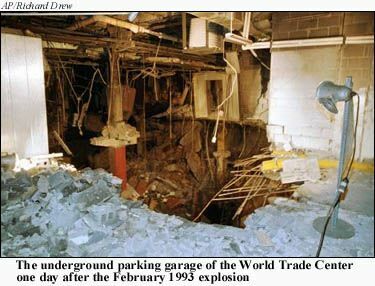 The terrorists parked a truck bomb with a timing device on Level B-2 of the underground garage, then departed. The ensuing explosion opened a hole seven stories up. Six people died. More than a thousand were injured. An FBI agent at the scene described the relatively low number of fatalities as a miracle. President Bill Clinton ordered his National Security Council to coordinate the response. Government agencies swung into action to find the culprits. The Counterterrorist Center located at the CIA combed its files and queried sources around the world. The National Security Agency (NSA), the huge Defense Department signals collection agency, ramped up its communications intercept network and searched its databases for clues. The New York Field Office of the FBI took control of the local investigation and, in the end, set a pattern for future management of terrorist incidents. Four features of this episode have significance for the story of 9/11. First, the bombing signaled a new terrorist challenge, one whose rage and malice had no limit. Ramzi Yousef, the Sunni extremist who planted the bomb, said later that he had hoped to kill 250,000 people. Second, the FBI and the Justice Department did excellent work investigating the bombing. Within days, the FBI identified a truck remnant as part of a Ryder rental van reported stolen in Jersey City the day before the bombing. Mohammed Salameh, who had rented the truck and reported it stolen, kept calling the rental office to get back his $400 deposit. The FBI arrested him there on March 4, 1993. In short order, the Bureau had several plotters in custody, including Nidal Ayyad, an engineer who had acquired chemicals for the bomb, and Mahmoud Abouhalima, who had helped mix the chemicals. The FBI identified another conspirator, Ahmad Ajaj, who had been arrested by immigration authorities at John F. Kennedy International Airport in September 1992 and charged with document fraud. His traveling companion was Ramzi Yousef, who had also entered with fraudulent documents but claimed political asylum and was admitted. It quickly became clear that Yousef had been a central player in the attack. He had fled to Pakistan immediately after the bombing and would remain at large for nearly two years. The arrests of Salameh, Abouhalima, and Ayyad led the FBI to the Farouq mosque in Brooklyn, where a central figure was Sheikh Omar Abdel Rahman, an extremist Sunni Muslim cleric who had moved to the United States from Egypt in 1990. In speeches and writings, the sightless Rahman, often called the "Blind Sheikh," preached the message of Sayyid Qutb's Milestones, characterizing the United States as the oppressor of Muslims worldwide and asserting that it was their religious duty to fight against God's enemies. An FBI informant learned of a plan to bomb major New York landmarks, including the Holland and Lincoln tunnels. Disrupting this "landmarks plot," the FBI in June 1993 arrested Rahman and various confederates. 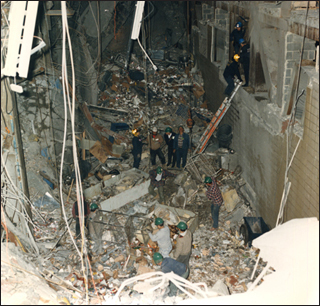 As a result of the investigations and arrests, the U.S. Attorney for the Southern District of New York prosecuted and convicted multiple individuals, including Ajaj, Salameh, Ayyad, Abouhalima, the Blind Sheikh, and Ramzi Yousef, for crimes related to the World Trade Center bombing and other plots. An unfortunate consequence of this superb investigative and prosecutorial effort was that it created an impression that the law enforcement system was well-equipped to cope with terrorism. Neither President Clinton, his principal advisers, the Congress, nor the news media felt prompted, until later, to press the question of whether the procedures that put the Blind Sheikh and Ramzi Yousef behind bars would really protect Americans against the new virus of which these individuals were just the first symptoms. Third, the successful use of the legal system to address the first World Trade Center bombing had the side effect of obscuring the need to examine the character and extent of the new threat facing the United States. The trials did not bring the Bin Ladin network to the attention of the public and policymakers. The FBI assembled, and the U.S. Attorney's office put forward, some evidence showing that the men in the dock were not the only plotters. Materials taken from Ajaj indicated that the plot or plots were hatched at or near the Khaldan camp, a terrorist training camp on the Afghanistan-Pakistan border. Ajaj had left Texas in April 1992 to go there to learn how to construct bombs. He had met Ramzi Yousef in Pakistan, where they discussed bombing targets in the United States and assembled a "terrorist kit" that included bomb-making manuals, operations guidance, videotapes advocating terrorist action against the United States, and false identification documents. 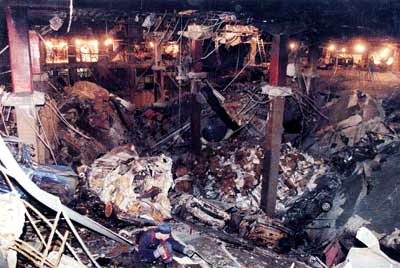 Yousef was captured in Pakistan following the discovery by police in the Philippines in January 1995 of the Manila air plot, which envisioned placing bombs on board a dozen trans-Pacific airliners and setting them off simultaneously. Khalid Sheikh Mohammed-Yousef's uncle, then located in Qatar-was a fellow plotter of Yousef's in the Manila air plot and had also wired him some money prior to the Trade Center bombing. The U.S. Attorney obtained an indictment against KSM in January 1996, but an official in the government of Qatar probably warned him about it. Khalid Sheikh Mohammed evaded capture (and stayed at large to play a central part in the 9/11 attacks). The law enforcement process is concerned with proving the guilt of persons apprehended and charged. Investigators and prosecutors could not present all the evidence of possible involvement of individuals other than those charged, although they continued to pursue such investigations, planning or hoping for later prosecutions. The process was meant, by its nature, to mark for the public the events as finished-case solved, justice done. It was not designed to ask if the events might be harbingers of worse to come. Nor did it allow for aggregating and analyzing facts to see if they could provide clues to terrorist tactics more generally-methods of entry and finance, and mode of operation inside the United States. Fourth, although the bombing heightened awareness of a new terrorist danger, successful prosecutions contributed to widespread underestimation of the threat. The government's attorneys stressed the seriousness of the crimes, and put forward evidence of Yousef's technical ingenuity. Yet the public image that persisted was not of clever Yousef but of stupid Salameh going back again and again to reclaim his $400 truck rental deposit. 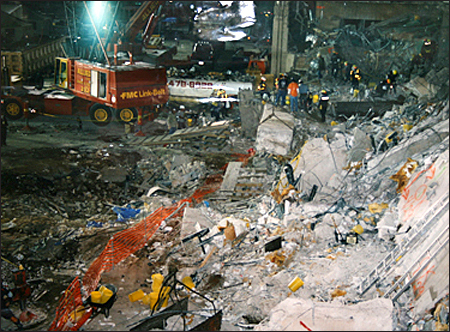 The epicenter was the parking garage beneath the World Trade Center, where a massive eruption carved out a nearly 100-foot crater several stories deep and several more high. Six people were killed almost instantly. Smoke and flames began filling the wound and streaming upward into the building. Those who weren't trapped were soon pouring out of the building many panic-stricken and covered in soot. More than a thousand people were hurt in some way, some badly, with crushed limbs. It was Friday, February 26, 1993, and Middle Eastern terrorism had arrived on American soil�with a bang. As a small band of terrorists scurried away from the scene unnoticed, the FBI and its partners on the New York Joint Terrorism Task Force began staffing up a command center and preparing to send in a team to investigate. Their instincts told them that this was terrorism they d been tracking Islamic fundamentalists in the city for months and, they d later learn, were tantalizingly close to encountering the planners of this attack. But hunches weren't enough; what was needed was definitive proof. They'd have it soon enough. The massive investigation that followed led by the task force, with some 700 FBI agents worldwide ultimately joining in quickly uncovered a key bit of evidence. In the rubble investigators uncovered a vehicle identification number on a piece of wreckage that seemed suspiciously obliterated. A search of our crime records returned a match: the number belonged to a rented van reported stolen the day before the attack. An Islamic fundamentalist named Mohammad Salameh had rented the vehicle, we learned, and on March 4, an FBI SWAT team arrested him as he tried in vain to get his $400 deposit back. One clue led to another and we soon had in custody three more suspects Nidal Ayyad, Mahmoud Abouhalima, and Ahmed Ajaj. We 'd also found the apartment where the bomb was built and a storage locker containing dangerous chemicals, including enough cyanide gas to wipe out a town. All four men were tried, convicted, and sentenced to life. The plotters. Yasin is still wanted for his alleged role in the attack. Meanwhile, the mastermind of the World Trade Center bombing was still on the run and up to no good. We'd learned his name Ramzi Yousef within weeks after the attack and discovered he was planning more attacks, including the simultaneous bombing of a dozen U.S. international flights. 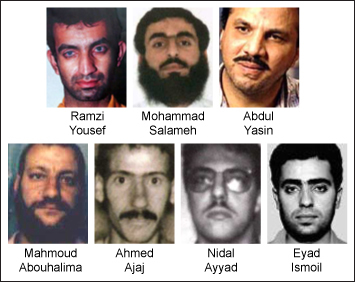 Yousef was captured in Pakistan in February 1995, returned to America, and convicted along with the van driver, Eyad Ismoil. A seventh plotter, Abdul Yasin, remains at large. We later learned from Yousef that his Trade Center plot was far more sinister. He wanted the bomb to topple one tower, with the collapsing debris knocking down the second. The attack turned out to be something of a deadly dress rehearsal for 9/11; with the help of Yousef's uncle Khalid Sheikh Mohammed, al Qaeda would later return to realize Yousef's nightmarish vision.